A wooden garden shed is not just for storing tools and garden equipment. Did you know that it can also be used to improve physical fitness? Forget paying out the nose for a gym membership – with a little creativity, you can turn your Devon shed into a bonafide work-out haven! In this blog post, we’ll show you how to set up a gym in your wooden garden shed. Gone are the days when you have to wait to use equipment in a busy gym. You can put together your own workout wonderland in the comfort of your own home. It’s time to get your body moving and save some money in the long run. The costs of living have increased dramatically over the years, and our time has become more valuable than ever before. With the average UK gym membership coming in at £32 a month, you are looking at spending nearly £400 a year. Combine this with the cost of travelling to and from the gym, as well as the cost of ‘looking the part’ with all the latest outfits, and you’re looking at a substantial amount. While setting up a gym in your wooden garden shed may sound rather expensive – the initial cost of gym equipment could put you off – when you compare the prices to annual gym fees, you could, in fact, end up saving thousands! It’s no good setting up a cheap, flimsy shed to store all your gym equipment – it wouldn’t be strong enough to support all that weight. Sheds To Last provide a range of wooden workshops and log cabins that are built using sturdy, durable materials and expert design. You may also want to consider implementing a solid concrete slab foundation beneath for added protection. If you’re not using heavy gym equipment, paving slabs may do the trick. In terms of space, you will need to consider how many pieces of gym equipment you require, and their size. Of course, if you only need room for an exercise bike and a few weights, that will take up substantially less room that a treadmill or rowing machine. It goes without saying, but the more space you have in your gym, the more options you’ll have. You may want to consider a large 25×7 wooden workshop – or go even bigger with our range of units. Once your new gym building has been erected, the next thing to consider is the flooring. Free weights, for example, are likely to be dropped occasionally, and heavy equipment can dent the floor. For additional protection, you should lay down some heavy duty rubber floor tiles. Not only will these keep your floor safe, but they also look great, come in a range of colours, and will give your shed a proper gym feel. Our Devon sheds come with a range of optional extras to suit your gym requirements. For example, why not put in double doors to ensure you can easily move equipment in and out of the unit? Or, add in windows and air vents to ensure you have adequate ventilation while you’re working up a sweat. You may also want to consider effective insulation throughout your garden shed come gym. Not only will insulation keep you warm during the winter, but it also means you can listen to those workout tunes without disturbing the neighbours. Think about all the things you usually see in a gym – wall clocks so you can time your workout sessions, mirrors, yoga mats, scales, etc. You may also want to put up some motivational posters to brighten up the walls or instructions for how to use the gym equipment properly. You will then need to consider which larger pieces of exercise equipment you want to add to your new gym – rowing machines, treadmills, weights and cross trainers, for example. And, with the advent of such sites as Ebay and Gumtree, you really don’t need to spend a fortune kitting out your gym. 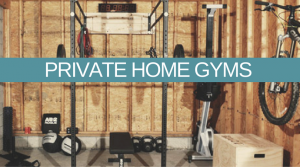 Have you set up a home gym in your wooden garden shed? We would love to hear from you if so! Alternatively, get in touch with Sheds To Last to discuss your options.